Second night of RED DUST FROM MARS five-day festival raising money for Hope Not Hate and Stand Up to Racism, to help fight against the rise of the far-right in this country. ARREST! CHARLIE TIPPER : The band began life in 2013 as The Charlie Tipper Experiment, releasing a debut album “Mellow On” and a couple of terrific singles. In 2015 they gained a new member and changed their name to The Charlie Tipper Conspiracy, embarking on a 6-track mini-album “Ten” and a series of EPs which culminated in the release of the 2018 compilation “The Astonishing Rise of Charlie Tipper”, which received some great reviews in the online music press. The band also released a joint single with the wonderfully names Helen McCookerybook to raise funds for the charity Refugee Action. In 2018 the band recognised the addition of a seventh member by changing their name again, the “Arrest” in the current name being a nod towards their recently releaed movie soundtrack “Themes from Blizzard”, a story of various lives (criminal and otherwise) which come together in a snowbound motel during a fierce blizzard. The band mixes the personal and the political to good effect, always with a melody and bringing noise or quiet as required. The influences of the American avant guard can be found, with the likes of the Velvet Underground, Galaxie 500, the Go-Betweens and Shack, all to be found mixed in amongst the real originality of their songs and sound. 2019 will also see the release of their fourth album “Red”, and set off on tour with the promise that all their earnings will be donated to anti-fascist organisations Hope Not Hate and Stand Up to Racism. PORK PIE: Indie post-punk three piece hailing from the seaside town of Weston-super-mare, and interesting band caught somewhere between raucous waves of post-punk rock and a misunderstood British picnic treat. Emotionally reeling you in far enough just to smack you over the head with a big slab on pie. 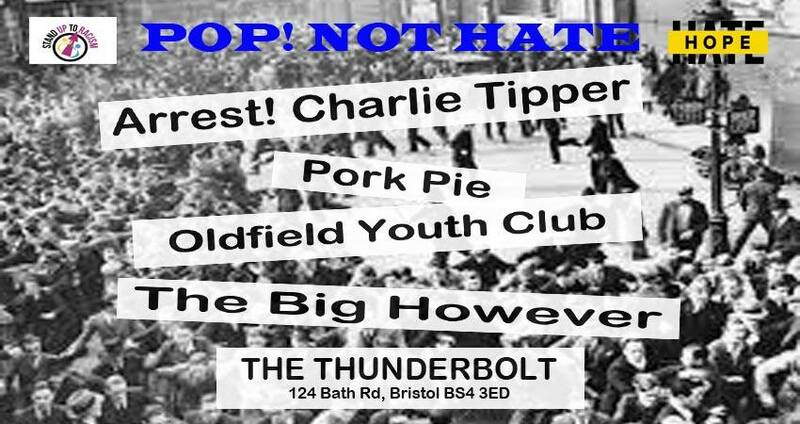 OLDFIELD YOUTH CLUB: Introducing Oldfield Youth Club…..formed in the Autumn of 2018 the OYC is made up of 3 quarters of critically acclaimed 1980's pop group The Last Party (2 No. Peel Sessions and Melody Maker Single of the Week with their debut single ‘Mr Hurst’). Featuring Simon Rivers (Bitter Springs), Neil Palmer and Kim Rivers, this trio play thoughtful catchy pop with rich lyrics and great melodies. The idea behind OYC was to pare down and simplify Simon’s songs and as a result most of them are short and powerful and very direct, with the trademark outstanding River’s lyrical content. The band have cut their teeth on a few gigs now ...supporting The Nightingales in Middlesbrough,The Bitter Springs in London, and more recently Austerity in Brighton. They are currently working on their debut album ‘The Hanworth are Coming’ featuring tracks aired at the live shows… ‘Our Flowers will Grow', 'A Kind of Loving in a Loveless Town' and ‘Bob Grant’. Eighteen months old, the Big However use discarded musicians found locally to create a warm, melodic, human sound featuring cello, clarinet, accordion, guitars, bass, drums, mandolin and vocal harmonies. Audiences have compared them to Robyn Hitchcock, Belle and Sebastian, the Fall and Lambchop.